Last year’s off-season was the epitome of stability and optimism. I spent the summer blogging about which national reporter had Michigan in his preseason top 15 and how Michigan was hot on the heels on Casey Prather and Trey Zeigelr. This summer is the polar opposite — the news continues to revolve around a mass exodus of bodies out of Ann Arbor. One early entry. Three assistant coaching departures. One dismissal. Just four returning players who have played in a collegiate game. Each and every change was for a different reason. They can all be explained or justified on their own merits. However, all of these changes in one summer is an ominous harbinger. Many people, myself included, have thrown out the team chemistry meme when discussing last season’s struggles. The issues that have surfaced over the last three months certainly lend credence to those theories. It is painfully clear that no one in the program was on the same page. John Beilein would not boot LLP for no reason. Yes, Laval was going to be in his last year of eligibility this year. He was also on thinner ice than most, but from what I hear it’s not that this move was some sort of cold blooded unjustified hatchet job. You can argue whether Laval would have been a contributor this year but removing him from the roster at the end of June doesn’t help anyone. Michigan wasn’t out of scholarships and can’t do anything with Laval’s vacated scholarship. Laval Lucas-Perry was not going to morph into a superstar over the summer. He was an inconsistent, streaky player. He’s had his moments (at Minnesota ’09 or at Penn State ’10) but he’s also been nearly invisible on the court for just about every other game. What a crazy, frustrating, career for Lucas-Perry. He committed to Arizona before transferring before he could get his feet wet after Lute Olson’s retirement. 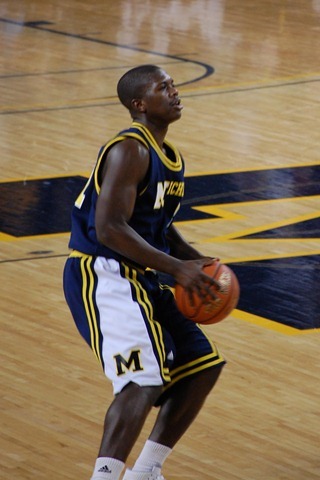 He waited patiently to start playing his first year in Ann Arbor amidst excitement from fans. A local guard who could shoot the rock was a great addition to a team that had already knocked off Duke. Then he shot the lights out for a month before going extremely cold. The next year and a half would be up and down. Struggles with confidence and inconsistency riddled Laval throughout his career and he could never seem to get it right. It becomes clearer by the day just how much of a rebuilding year we are bracing ourselves for. Douglass, Morris, Novak, and Vogrich are the only returning players with college experience. Blake McLimans is dealing with playing at a new weight. Jordan Morgan is still recovering from injury. Evan Smotrycz and Tim Hardaway were likely to play significant roles but this ups the ante. Like it or not, attrition has been a staple of John Beilein teams. The list of players that have left the program under Beilein now reads: Reed Baker, Kendrick Price, K’Len Morris, Jerrett Smith, Ekpe Udoh, Kelvin Grady, and Laval Lucas-Perry. In five years at West Virginia, 5 of the 17 players that Beilein recruited left the program. Michigan now has two additional scholarships to give in the class of 2011. Assuming they use both of them, they’d have two more in the class of 2012. The scholarship breakdown needs to be updated but you can find it here.